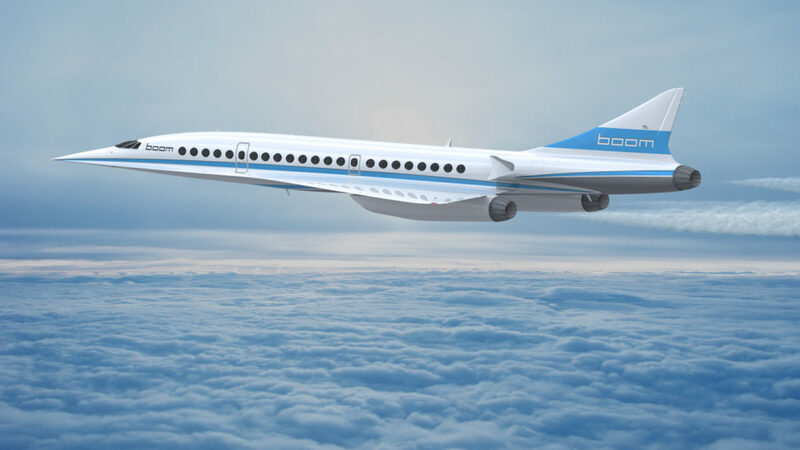 Boom Supersonic, a startup from Denver with ties to Virgin’s Sir Richard Branson, just unveiled the first working prototype for its project. The aircraft can travel at Mach 2.2 (1,451 mph) or more than twice the speed of sound. The XB-1 craft, nicknamed ‘Baby Boom’, is a one-third scale realization of the Boom passenger airliner which can carry up to 45 (wealthy) people on two routes that are planned to open sometime in the near future: London-New York City and San Francisco – Tokyo. Both trips won’t take more than 3 hours instead of 10 hours, as is the norm today. The first supersonic commercial flight was made in 1976 on the Concorde’s maiden flight. After several thousand flights, disaster struck when Air France Flight 4590 crashed killing all 100 passengers and nine crew members. That was the final drop in the bucket for the Concorde which was already struggling. Simply put, the Concorde was way ahead of its time and when you import the future, you have to pay big. The Concorde drank fuel like a thirsty elephant and often airlines struggled to sell tickets. The sonic boom didn’t help one bit, causing complaints from citizens unfortunate enough to find themselves beneath the Concorde’s sonic defying trail. And although the journey was business class, a flight on the Concorde wasn’t entirely pleasant with many former customers complaining about the noise. At the end of it all, however, you could still get to London from New York in under three and a half hours, and that meant a lot for some people. Boom Supersonic wants to offer the supersonic flight experience adapted to the 21st century. It also wants to make money and not lose it, like the Concorde. The Boom is supposedly a marked improvement over the Concorde, owing to its advanced composite materials and new jet engine technology. Powering the plane are three General Electric J85-21 turbojet engines, fed by two variable geometry supersonic intakes. Each engine has a variable geometry nozzle system. As for the fueling system, some 7,000 lb of jet fuel is stored in 11 separate tanks that include fuselage and wing tanks. Jet pumps provide a reliable stream of fuel to each of three engines. The company expects tickets to run at $5,000, which is fairly what business class customers already pay for a trans-Atlantic flight nowadays. The first tests should run late 2017. Right now, the XB-1 is under construction at Boom’s hangar at the Centennial Airport.